If you own a Corvette you want a portrait of, let me know. 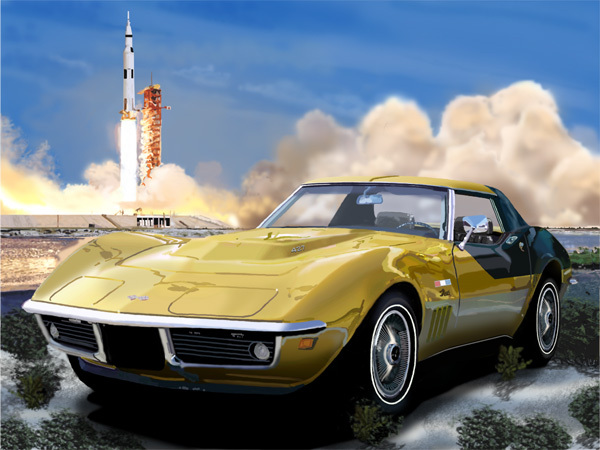 “Moon Struck” Depicted in this artwork is the first year for the new Corvette design inspired by the Mako Shark II show car. It debuted as a 1968 model and was the third generation of the famed American Sports Car.. Contact artist to order. 1967 427 Corvette in the Smokie Mountains of Tennessee. 22" by 17" Giclee from acrylic painting. Digital art requires the same attention to detail as a hand brushed painting, and can take equally as long to plan and comple. Layers are created for practically each item pertaining to the car or the background and are combined resulting in the final image. In this art piece the layers were first combined to create the image of the car and later duplicated and randomly placed to create the background. This piece of art is being used as instruction for K thru 12 art students across the nation. 22" by 17" Giclee from digital art. Layering to give depth and tone has been around since the Flemish painters likeVan Eyck. 1954 Corvair show car and Japanese Bullet train Nozomi series 500 type 521. The Japanese are great collectors of old American cars. In future plan to have painting scanned for better resolution. 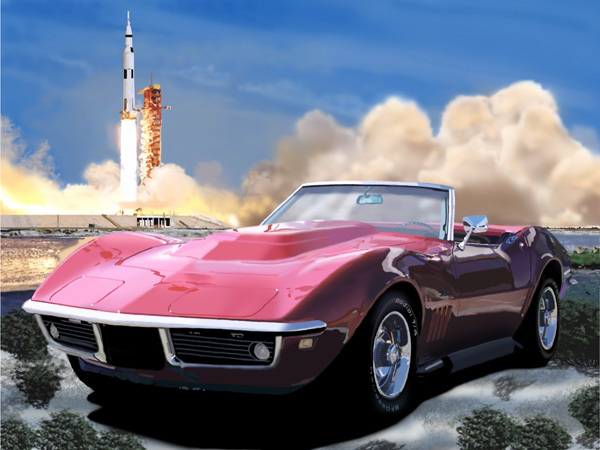 1967 427 Corvette and F15. 22" by 17" Giclee from acrylic painting, Contact artist for availability. 1953 Corvette Motorama show car. The first Corvettes were powered by a six cylinder engine following the practice of European sports cars. A V8 was placed into later Corvettes to satisfy American demand for a V8. 22" by 17" Giclee from digital art. 1967 Corvette Stingray. Only a rally driver would attempt this. 22" by 17" Giclee from digital art. 1955 Corvette. It was never a sure thing that Chevrolet's new Corvette would remain as a company offering. It looked like curtains for the sports car but it endured over Ford's two seat car. 22" by 17" Giclee from digital art.